<b>HELPING HAND: </b> Led by Keith Terry, the nonprofit YStrive has helped 62 “at-risk” kids graduate high school since 2006. Lena Terry remembers seeing her future husband speak from the pulpit for the first time, when she was new to Santa Barbara and searching for a church. Friendship Baptist sounded most inviting, and that’s where she found Keith Terry giving a sermon titled “That Was Then, This Is Now.” That phrase, it turns out, could serve as a tagline for Keith’s entire existence. Today, from a cramped office adorned with posters of César Chávez, Malcolm X, and Martin Luther King Jr., behind that same church on the corner of Cota and Milpas streets, Keith Terry runs a nonprofit called YStrive, which offers educational opportunities and job-training skills for the riskiest of at-risk youth. “We take young people who other programs won’t take or can’t take, and we help them reach their goals with education and employment,” said Terry. In other words, when everybody else has given up on these kids, Terry finds the power to forgive. Though theology has no real place in YStrive, I imagined that such a trait must be rooted in Terry’s faith, so I paid a visit to Friendship Baptist one Sunday in March to watch Terry preach. It was the type of sermon you might expect to hear in any church, but Terry’s delivery is artful, his voice trailing off into a quiver toward the end of his most pitched sentences, almost as if he is about to cry — a quality reminiscent of Martin Luther King Jr., who also happened to be a Baptist preacher. And like MLK, Terry finds inspiration for social movements from his spiritual life, evidenced by his increasing role in the Pro-Youth Coalition meetings and presence in Black Lives Matter protests. Keith Terry “should be a national treasure,” believes Michael Wilds, whose Oxford Academy offers classes to YStrive students at a reduced cost. “He goes to homes of kids, brings them food,” he explained. “He gets people to donate clothes and food, provides them jobs.” Terry’s been known to offer his office as a crash pad and to work for free on job sites that require a minimum amount of workers so his trainees don’t lose out on a paycheck, and he personally ended a bullying situation for one San Marcos High student who’s now thriving at Westmont College. Bonnie Switack, a former assistant principal at La Cuesta High School, recalled Terry helping a murdered student’s family cope with their loss, even setting up a scholarship fund in his name. She met Terry at La Cuesta, where he ran a California Gang Reduction Intervention Prevention program that helped countless kids graduate and go on to college. “He had a way of talking to them that made them listen,” she explained. 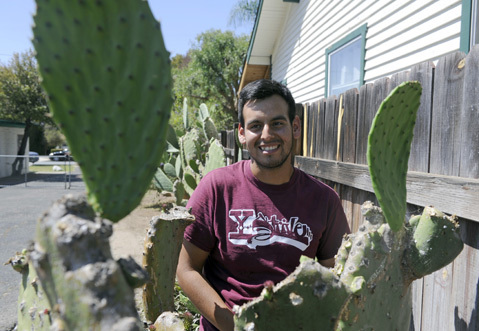 When funding ran out in 2006, three students urged him to direct his own organization “to help the homies.” He met with them over burritos at Super Cucas to explain how daunting that would be, but they wouldn’t let him say no. His first donation came from Kathy Abney, former principal of La Cuesta. Then Switack’s husband, who owned Service Master Carpet Cleaning, retired and donated his old equipment to YStrive, which means Youth, Succeeding through Training, Restorative Initiatives, Volunteering and Education. The carpet-cleaning equipment became a foundation of YStrive’s job program, which is known as PCS and now also includes a moving company, construction, carpentry, and landscaping, all of which is licensed, bonded, and insured. On the back end, other YStrive clients learn office skills such as scheduling, invoicing, and bookkeeping. Terry pays his clients to be trained and then contracts them out to paying customers. They still use Switack’s stuff, although one of their customers, Sierra Property Management, recently ended their relationship because the equipment is so outdated. It will cost $18,000 to update, but such financial hurdles are only one challenge of the jobs program and the reason YStrive is perpetually on life support. Compared to the educational side of YStrive ​— ​which is lean and successful, relies on volunteers, and offers family support groups, tutoring, and the Oxford courses ​— ​the job program works with clientele that tends to be both older and on the more intense side of the “at-risk” spectrum. Aside from growing up in poverty or with single parents or as minorities or with learning disabilities, many of these clients are gang-affiliated (20 percent in 2013), some have been incarcerated multiple times, some struggle with substance abuse, and almost all come from broken homes. 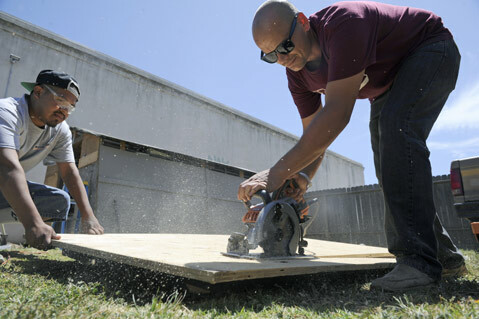 <b>SAFETY FIRST:</b> Trainer Bobby Jacobs (right) demonstrates proper use of a circular saw with the help of Oscar Cervantes. A navy veteran, Terry originally moved to Santa Barbara in 2000 to take a job as a locksmith at UCSB. He entered the world of gang intervention when he met Matt Sanchez, the ex-Eastside shot caller who founded programs like All for One and Hoods in the Woods, at New Life Church Santa Barbara. Terry’s relationship with the late Sanchez would endure, but he moved away from the bustling New Life church because he felt as if he could do more for a church with a struggling congregation. The same can be said for Terry’s success stories. 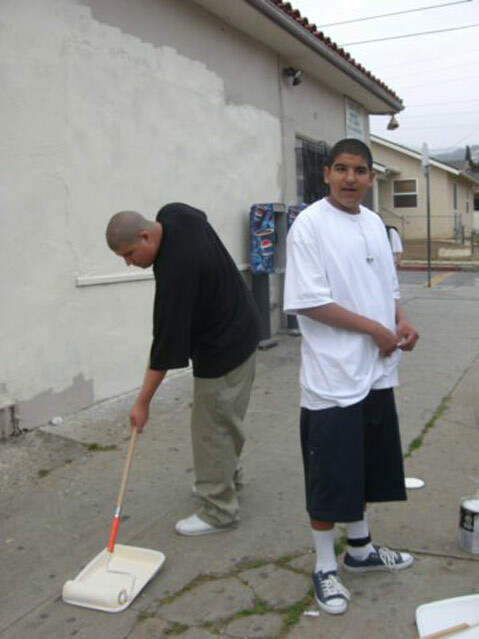 Take one young man, who came to YStrive in 2011 and now works as a mentor. A two-striker named in the city’s failed gang injunction who was diagnosed with both OCD and ADHD as a child, he grew up with a father in and out of prison. His mother held two master’s degrees from Mexico but came to Santa Barbara to work as a housekeeper because she thought he would have a better shot at keeping his nose clean here. His lifestyle almost proved fatal. While incarcerated at Calipatria State Prison, another inmate threw him off the top tier. He broke both arms and his jaw, nose, and an ankle. He dislocated his hip, and his mouth was wired shut. It was during his recovery that he gained an admiration for his physical trainer, a profession that he would like to one day enter. Because his second strike is categorized as a hate crime, he can’t spend time in certain public spaces, including college campuses. So for the time being, he teaches YStrive clients carpentry skills and safety protocol. Terry can empathize with such people because his own youth is checkered with destructive behavior. He modeled YStrive in part after a New York City mentorship program called Inner City Youth that a judge assigned him to after he stole a car at age 15. 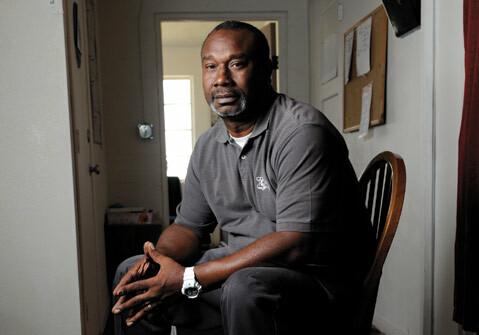 As an adult, Terry’s first experiences in intervention were as a night watchman for the Hoods in the Woods program that took rival gang members on camping trips. The further the kids got from Santa Barbara, Terry explained, the more visibly relaxed they became. They didn’t need to look over their shoulders for cops; they didn’t need to impress their homies; they didn’t need to put on a tough facade. They were finally free to just be kids. 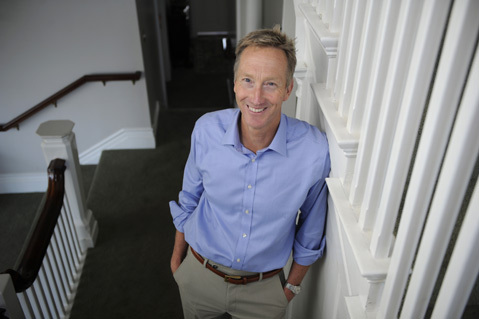 <b>INVESTING IN THE FUTURE:</b> “We want things to be different 10 years from now,” said Jon Clark, who heads YStrive’s primary backer, the J. S. Bower Foundation. Another inspiration for YStrive is Homeboy Industries, the famed Los Angeles intervention program that runs several businesses, including a silk-screening shop, bakery, and food truck along with job training, mental-health services, and tattoo removal. But Terry has nowhere near Homeboy’s support or staff. Still, Clark is not in the business of throwing money down the toilet, so last fall he hired UCSB education professor Jill Sharkey to evaluate YStrive by comparing clients’ recidivism rates to the general population. She found that the data pool was too small, explained that recidivism alone may not tell the whole story, and advocated better tracking of clients to aid future evaluations. Last week, while I was at YStrive, Cervantes stopped by after being a no-show for a landscaping job. Terry turned from me to Cervantes and said, “Do you like ice cream? Let’s go get an ice cream.” Perhaps Terry’s greatest product is not skills but unconditional love. That doesn’t cut it for everybody. County probation doesn’t refer kids to YStrive, in part because Terry ignores conventional advice, like not commingling juveniles with adults. (In the time I spent there, I met one juvenile in the job-training program, a 17-year-old.) They prefer techniques such as Moral Reconation Therapy (MRT), which requires intensive counseling sessions focused on reasoning and logic skills two or three times a week, said Steven DeLira, Santa Barbara County’s deputy chief probation officer. But he admitted that it’s tough to get somebody who is not in custody to adhere to such a program. <b>COMING OF AGE: </b> Julio Rincon Delgado (left), who is in YStrive’s job training program, would like to work in sustainable permaculture. Keith Terry wants to track the YStrive clients better and is implementing a number of Sharkey’s suggestions, including new survey materials. But tracking well takes training and time, and Terry already lost a key staffer earlier this year. If he’s the passionate face of YStrive, Alma Hernandez was the steady balancing force in the background. Hernandez’s uncle lives right across the street from Friendship Baptist, and she joined a church youth group at the age of 10. She helped found YStrive at age 16 and worked her way up to become instrumental in applying for and administering grants. 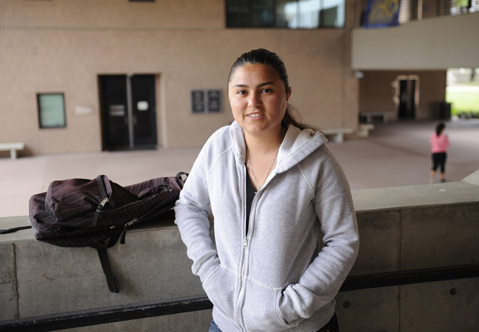 She enrolled in SBCC and then transferred to UCSB all while working at YStrive and left the organization when her studies in communication got too rigorous to keep a job, as well. Alma Hernandez helped run YStrive for 10 years while, with encouragement from Terry, also pursuing higher education. She graduates UCSB next month. Terry professes the theory that “the further you are socially, culturally, financially from the people you serve, the less able you are to help them” ​— ​that empathy dies with distance. If YStrive were nothing more than an enduring reminder of our less-fortunate neighbors, a smoke signal from a forgotten island in our collective conscience, that might alone make it worthwhile. But if Terry is to become a martyr who tends to hopeless souls so that we can continue on with our everyday lives, that may be a sin too big to forgive.